Caring for a senior parent with dementia can be difficult. It is important to remain calm and develop good caregiving strategies to make the role less intimidating. Here are some tips family caregivers can use when caring for an aging parent with dementia. Aggressive speech may confuse and scare your loved one, causing him or her to react in a negative manner. It is important to remain positive and speak calmly and clearly to your loved one to prevent him or her from becoming upset and agitated. Instead of using words like “no” or “you can’t,” try to be reassuring and loving. Do not fuss at your loved one or belittle him or her in any way. Keep in mind your loved one is living with a life-altering health condition, at no fault of his or her own. Many seniors with dementia have a habit of wandering, which could put their safety at risk. They could injure themselves or possibly get lost. When caring for a parent with dementia, you need to take sensible safety precautions. For example, never leave the doors unlocked in your home, and make sure the windows are shut and locked. You should also remove sharp objects from the counters and dressers. It is a good idea to install an alarm system that will go off each time a door is opened. Other safety gadgets include emergency bracelets that detail your loved one’s name, address, and phone number in case he or she wanders off or lands in an emergency situation. Hiring a professional caregiver is one of the best ways to ensure your senior loved one enjoys a safe and comfortable life in the comfort of home. Families shouldn’t have to worry about finding reliable elderly care. Richardson Home Care Assistance is a leading provider of elderly home care. We offer a proprietary program called the Balanced Care Method, which uses holistic methods to promote senior health, our caregivers and Care Managers are available 24/7, and all of our in-home care services are backed with a 100% satisfaction guarantee. Your loved one may not remember his or her surroundings, and he or she might become upset and ask to go home. It can be difficult to watch your parent’s health and memory decrease, but you will need to make him or her understand without being forceful. Walk your loved one around the home and show him or her familiar items such as photos, rooms, and various objects that could spark a memory. An explanation and tangible reminder can help seniors with dementia maintain a better understanding of their surroundings. Do not go into detail. Instead, keep your explanations simple and clear. It is not uncommon for seniors with dementia to accuse their family caregivers of negative things such as providing poor care, stealing items, or going against their wishes. Although such behaviors are normal, it could still hurt to hear these accusations from your parent. Remember your loved one’s brain is deteriorating, causing errors in thinking. It doesn’t mean your loved one actually believes you stole from him or her. It simply means the disorder is causing poor judgment. Do not argue with your loved one at any point. You can calm the situation by retracing your loved one’s steps and helping him or her find the missing objects. Caring for older adults with serious health issues can be a challenging task. Families who find it difficult to care for their aging loved ones without assistance can benefit greatly from professional respite care. Richardson, TX, family caregivers who need a break from their caregiving duties can turn to Home Care Assistance. 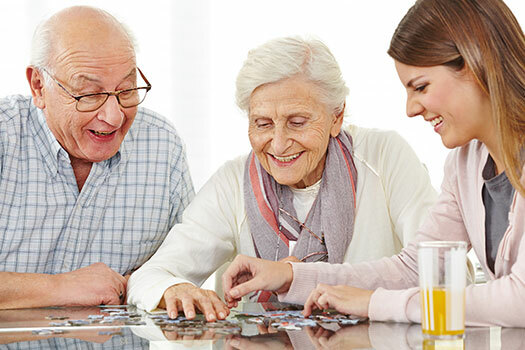 Using our proprietary Balanced Care Method, our respite caregivers can encourage your loved one to eat well, exercise regularly, get plenty of mental and social stimulation, and focus on other lifestyle factors that promote longevity. To learn about our premier in-home care plans, give us a call at (469) 573-4213 today.